An overnight sleep study is the primary service All Care Sleep Center provides for patients concerned to have any sort of sleep disorder. The sleep study will be either a complete diagnostic test, or a split-night study (first part of the night consists of a diagnostic study to assess for sleep disorders; the second part of the night consists of treatment with PAP therapy for the sleep-disordered breathing). (MSLT) is done to quantify daytime sleepiness and is often performed to rule out narcolepsy. (MWT) is performed to assess a patient’s ability to stay awake. Physician Consultations will assess for sleep problems such as sleep apnea, insomnia, narcolepsy, restless legs syndrome, periodic limb movement disorder, circadian rhythm disorders (jet lag, delayed or advanced phase sleep disorder, etc) and parasomnias (sleep walking, REM behavior disorder, etc). Physicians at All Care utilize various approaches to treat sleep disorders. 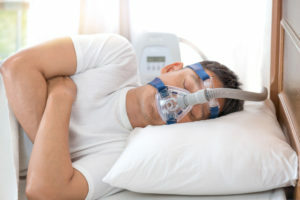 Sleep Apnea patients may be prescribed CPAP, an Oral Appliance, or when appropriate, surgery. Our specialists will ensure that you are given all the information to make the best decision for your own health. All Care Sleep Center accepts all major insurances.